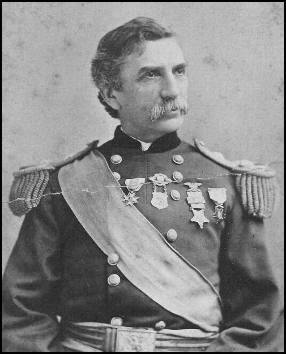 John Frederick Hartranft (December 16, 1830 – October 17, 1889) was the governor of Pennsylvania from 1873 to 1879 and a Union General who received the Medal of Honor for his actions during the American Civil War. Hartranft was born in Fagleysville in Montgomery County, Pennsylvania, near Pottstown. He attended Marshall College in Virginia and received his degree in civil engineering in 1853 from Union College in Schenectady, New York. He briefly worked for two railroads in eastern Pennsylvania before returning home to Norristown to assist his father in the real estate and stage line businesses. In 1854, he was appointed deputy sheriff of Montgomery County. That same year, he married Sallie Douglas Sebring. They had six children, but three died in infancy. Hartranft was active in the Norristown fire company and the local Freemason lodge. Hartranft was admitted to the bar in 1860, and rose to the rank of colonel in the Pennsylvania Militia. In April 1861, Hartranft raised a Montgomery County regiment of ninety-day volunteers in Norristown, serving as colonel of the 4th Pennsylvania Volunteer Infantry. Their term of enlistment up, the regiment returned to Pennsylvania on the eve of the First Battle of Bull Run, just as the firing began. Hartranft was humiliated by his men's decision to go home. He stayed to fight with the Army on July 21, 1861. This act earned him the Medal of Honor on August 21, 1886, for volunteering his services to fellow Pennsylvanian Brig. Gen. William B. Franklin. His citation reads: "Voluntarily served as an aide and participated in the battle after expiration of his term of service, distinguishing himself in rallying several regiments which had been thrown into confusion." Hartranft raised a three-year regiment, the 51st Pennsylvania Infantry, and became its colonel. They first served on the North Carolina coast in the Burnside Expedition, Hartranft led them in battle at Roanoke Island and New Bern. In July 1862, Hartranft's men proceeded to Newport News, Virginia, to become part of Burnside's IX Corps, with whom they fought in the Second Battle of Bull Run and at South Mountain. They also fought at the Battle of Antietam, where Hartranft led its famous charge across Burnside's Bridge, suffering 120 casualties. They also participated in the Battle of Fredericksburg. The 51st Pennsylvania was transferred to the Western Theater, where Hartranft saw action at the battles of Vicksburg, Campbell's Station, and Knoxville; in the latter two actions, he served as commander of the 2nd Division of the IX Corps while still a colonel. He commanded the 1st Brigade, 3rd Division, of the IX Corps in the 1864 Overland Campaign, participating in the fighting at the Wilderness and Spotsylvania before he was promoted to brigadier general, as of May 12, 1864. He continued in operations against Richmond and Petersburg. His brigade distinguished itself in the Battle of Peebles' Farm. When the IX Corps was reorganized, he was given command of a new 3rd Division, consisting of newly raised Pennsylvania regiments. Hartranft was brevetted major general by Lt. Gen. Ulysses S. Grant for defeating Confederate General Robert E. Lee's last offensive at the Battle of Fort Stedman, bringing his untested division from its reserve position and counterattacking to recover the captured fort. At the war's end, Hartranft commanded the Old Capitol Prison and was appointed a special provost marshal during the trial of those accused in the Lincoln assassination. He was noted for his kind treatment toward Mary Surratt, the first woman executed by the Federal government. On July 7, 1865, Hartranft led Mary Surratt, Lewis Paine, David Herold and George Atzerodt to the gallows in what is now called Fort Lesley McNair. He read them their last rights, and they were hanged. Hartranft switched party allegiances following the war and became a Republican, serving in former general John W. Geary's Pennsylvania administration as Auditor General from 1867 to 1873 before being elected governor in 1872. He was a strong advocate of education, municipal reform, regulation of banking, improved industry and commerce, and the reorganization of the National Guard. He supported suffrage for African Americans, fought the corrupt Simon Cameron political machine, and championed the rights of the workingman. During his administration, the revision of the Commonwealth's constitution was completed and ratified as the Constitution of 1873, which prohibited special and local legislation and changed the terms for members of the state legislature to two years instead of one, and state senators from three years to four. He was the 5th commander-in-chief of the Union veterans’ organization, the Grand Army of the Republic, serving from 1875 to 1877. The United States celebrated its centennial as a nation in 1876, and Hartranft saw that Pennsylvania led the way in the celebration that was centered in Philadelphia's Fairmont Park. At the Republican National Convention in June 1876, he was a contender for the presidential nomination that eventually went to Rutherford B. Hayes of Ohio, who had served with Hartranft during the Civil War in the same army corps. During his second term, economic depression and unemployment, following the industrial boom of the early 1870s, caused several serious civil disturbances, including the railroad strikes of 1877 and the incidents with the Molly Maguires in the anthracite coal regions. Hartranft called out the state militia and then Regular Army troops to maintain order. In Philadelphia, Reading, and Pittsburgh, fires burned and eleven people died along the Schuylkill River before Federal troops restored the peace. Hartranft later proposed recognition of labor unions and arbitration of claims. Concerned with the governor's precedent in calling out the militia to battle civilians in Pittsburgh, the District Attorney of Allegheny County tried to force Hartranft to appear before a grand jury to explain his rationale. The courts backed Hartranft when he refused to appear. Their ruling became known as the "Hartranft Decision." Hartranft returned to his home in Montgomery County in 1879, where he accepted the position of Postmaster. He was subsequently appointed Port Collector for Philadelphia. He was also reappointed to command the Pennsylvania National Guard, which he had helped develop. He became the first commander of the 28th Infantry Division from 1879-1889. John Hartranft died in Norristown and was buried in Montgomery Cemetery. The Pennsylvania National Guard later provided an obelisk for his grave. An impressive equestrian statue next to the Pennsylvania Capitol Building in Harrisburg honors Hartranft. Camp No. 15 of the Sons of Union Veterans of the Civil War is named in his honor. Marble monuments at Petersburg and Vicksburg honor his Civil War service. An elementary school in Norristown is named for the governor as well as another elementary school in Philadelphia. The Hartranft section of Philadelphia, and a street in South Philadelphia, Packer Park, Philadelphia, Pennsylvania near the sports complex are also in his honor. A residence hall at the University Park campus of Pennsylvania State University is named after him. An avenue bears his name in Norristown, Pennsylvania along with a boulevard in nearby East Norriton, Pennsylvania and another in Fort Washington, PA. A street in the Brookline section of Pittsburgh, Pennsylvania is also named after him. Rank and organization: Colonel, 4th Pennsylvania Militia. Place and date: At Bull Run, Va., July 21, 1861. Entered service at: Norristown, Pa. Born: December 16, 1830, New Hanover Township, Montgomery County, Pa. Date of issue: August 26, 1886.